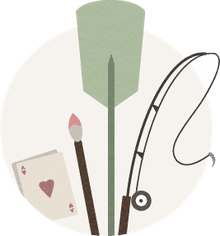 Plein air painting can be very rewarding, and with a little practice you'll soon know what to pack and what to leave behind in your studio. Photo © Marion Boddy-Evans. Licensed to About.com, Inc.
Plein-air is a term derived from the French phrase en plein air, which literally means "in the open air." It's a familiar concept today, but in the late 1800s when the Impressionists ventured out of their studios into nature to capture different lighting at various times of day, it was revolutionary. What and Where Do I Paint Plein-Air? Your subject matter is entirely up to you, but remember that you don't have to paint everything you see; be selective, and think about the essence of the scene. That said, focus on what you see, not what you can imagine or intellectualize about the subject (otherwise you may as well be back in your studio). Consider scouting out locations in advance to decide what you're going to paint, what time of day, and where you would set up. This way when you head out to paint you can spend the whole day painting and take along the best selection of colors for that particular scene and lighting conditions. Look around, 360 degrees, so you don't miss the possibilities "behind" you. Don't think that your location needs to be somewhere far away or exotic. You can go to a local park, to a friend's lovely flower garden, or to a table in a coffee shop. The ideal spot to set up will be in the shade, out of the wind, but this often isn't possible. If you use an umbrella for shade, be sure that it doesn't cast any color on your canvas. There's something about seeing an artist at work that makes people inquisitive, more likely to talk to a stranger, and prone to giving unwanted opinions. It can be disconcerting, especially if your painting isn't going well, and quite disruptive if it happens a lot. Consider positioning yourself where people can't come up behind you, such as against a wall or in a closed doorway. If you don't wish to chat, be politely nonresponsive along the lines of, "I'm sorry. I can't talk right now. I've only a limited time to do this." Most people simply want a closer look at what you're doing, and so saying "Feel free to have a look," then getting on with what you're doing is all it takes. Some people will be keen to give you all sorts of uninvited advice; be thick-skinned and try to get rid of them with extreme politeness, for instance with a "Thank you, but I'm fine with what I'm doing." The scene in front of you will change as the sun moves across the sky. For example, strong shadows in the early morning will shrink as lunchtime approaches. Start by putting in the main shapes across the whole painting and then the detail. If you work slowly and can be in the same spot for several days, consider having different canvasses to record the scene at different times and create a series of paintings. As the day progresses, change from one canvas to the next. Purists will argue that a plein-air painting needs to be started and finished outside the studio, but surely it's the end result that counts, not simply where you created it. If you prefer to sketch or make preparatory paintings to work up in the studio, do so. If you can afford to, keep a separate set of supplies for plein-air painting to make it easy to pick everything up and go, rather than having to pack your art materials up every time. Despite the fact acrylic and oil paints are nonflammable, it's best to pack them into your bag that will be checked, rather than carry them in your hand luggage and risk having some overzealous security guard confiscate them because they don't believe you. Also, put your brushes and palette knives in your checked baggage, as they could be considered potential weapons. Mediums, turpentine, and mineral spirits should be regarded as hazardous and not be taken on a plane; buy them at your destination. If in any doubt, get a hold of a product information sheet and check with the airline. A variety of sketching or portable easels are on the market that are light and fold up quite small, but you could simply prop up your board on something, such as the bag you carry your art materials in. If you're painting from your car (such as when it's raining) you could prop it up on the dashboard. 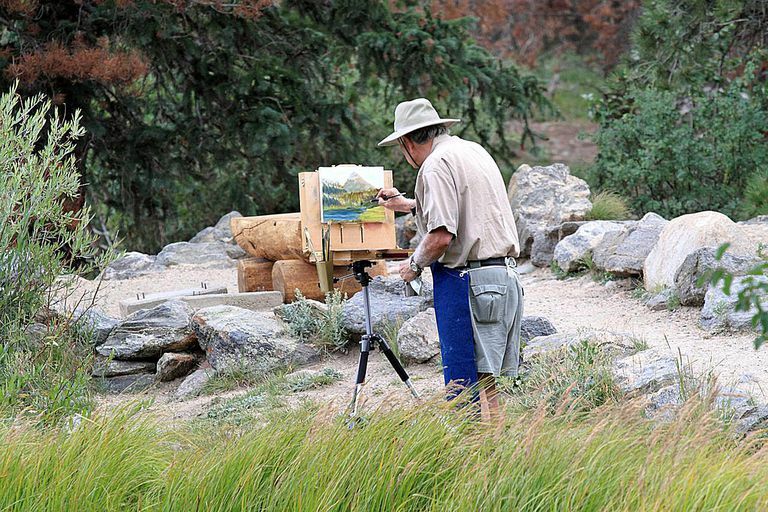 First, see how much you enjoy plein-air painting before investing in another easel. Unless you have space in your car to put a canvas down flat, transportation can be tricky. If you're using oils, use a medium that speeds up drying. A French easel may enable you to attach a canvas to it for transporting back home. Some art stores sell clips that can be attached to canvases to separate them. If you're happy painting smallish pictures, consider a pochade box, a nifty, compact box that holds several wet panels in the lid and your paints in the bottom; a palette keeps your paints in place and slides out when you want to use it.